Regular standing, fidgeting, and skipping a Netflix binge for a walk around the block are all fine and dandy, but to pump up the volume on your heart and lung function, you need to pump up the volume on your workouts. These four equipment-free aerobic exercises will do the trick to maximize your heart health. Plus, you'll feel better knowing that your tough cardio sessions kind of help counterbalance all those weekends spent lying around on your couch. Love it or hate it, there are few other exercises that elicit as powerful a cardiovascular response as running. This is because you’re engaging all your major muscle groups, particularly the large muscles of your lower body, to carry your entire weight over the course of several miles. That's hard. To maintain a steady stream of fuel to your working muscles, your breath rate and heart rate increase to pump more oxygenated blood to your working muscles. This is the definition of a cardiovascular workout. But if you’re sitting there thinking, "There is no chance in hell I'm about to run for 30 minutes straight," don't worry, no one's asking you to. 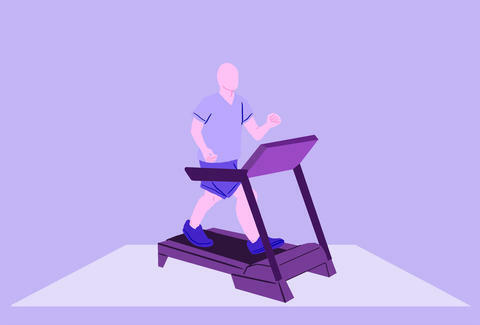 High-intensity interval training (in this case, interval running) is every bit as good at improving heart health as slower, prolonged, steady-state exercise. All you have to do is alternate between periods of high-intensity running and lower-intensity walking. Because you'll increase your heart rate significantly during the high-intensity intervals, your heart rate will remain high even during the lower-intensity intervals as your body works to recover. So while mentally and physically you give your body a break, physiologically you continue to work. If you're just starting out, try a 1:2 ratio of all-out effort to low-intensity work. For instance, you might run as fast as you can for 30 seconds, then give yourself 60 seconds to recover before your next running interval. As you feel yourself improving, you can graduate to a 1:1 ratio (for instance, 30 seconds of work to 30 seconds of recovery time), or even a 2:1 or 3:1 ratio of work to rest. And remember, the key words here are to run "as fast as you can" -- depending on your fitness level, this may be the equivalent of a fast walk. Trust me, that's OK.
Burpees just might be the perfect exercise… depending on your definition of perfect, of course. A standard burpee engages almost all your major muscle groups, from your chest, shoulders, and abs to your glutes, quads, and calves. The fast-paced transition from standing to plank to crouch to standing also revs up your heart rate for an effective cardiovascular workout. In fact, researchers have found that burpees are just as good, if not better, at maintaining fitness levels as more traditional high-intensity interval work -- even when people do them for a shorter period of time. So, yeah, burpees are king. Stand tall, your feet shoulder-width apart, your knees slightly bent, your core engaged. Crouch down, placing your palms on the ground under your shoulders. One at a time, step each leg back so you're in a high-plank or push-up position, your body forming a straight line from heels to head. Immediately step each leg forward again to your crouched position, then stand tall. Repeat these steps as fast as you can with good form for 30 seconds. Rest for two to four minutes, and repeat. Perform four to eight sets. Jumping jacks are one of my all-time favorite cardio exercises for four reasons: 1) They engage your entire body, from your calves to your shoulders, 2) you can (almost) literally do them anywhere, 3) they involve lateral abduction and adduction movements of your hips and shoulders that are a break from the more traditional forward-backward movements of most cardiovascular exercise, such as running, cycling, and swimming, and 4) they involve jumping, which is great for cardiovascular health and bone density. But in a nod to Reading Rainbow, you don't have to take my word for it… read about it! In a 2016 study, when researchers analyzed the energy expenditure (i.e., calorie burn) of 70 different activities performed by youth and adolescents, jumping jacks, hands down, resulted in the highest metabolic response. They elicited a higher oxygen intake post-workout than running on a treadmill at six miles per hour or playing a game of basketball. Like the other exercises on this list, though, jumping jacks are more challenging than you'd think. Interval training is your best bet for incorporating them into a workout. 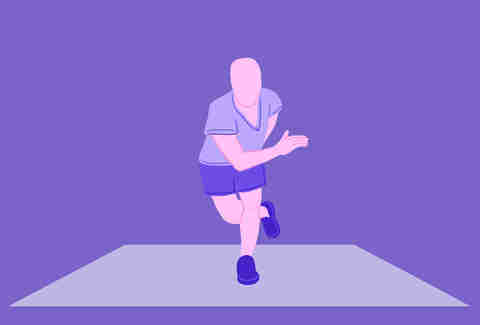 Try performing a jumping jack Tabata (perform eight sets of 20 seconds jumping jacks followed by 10 seconds rest), or try this 1:2 ratio of work to rest, with 30 seconds of jumping jacks followed by a minute rest. Do this for 10 to 20 sets, and you'll have worked up a sweat! The movement pattern of skaters is unconventional, requiring greater engagement of your abs, obliques, and low back. And, like burpees, there are a number of progressions that make them appropriate for all fitness levels. To enjoy the biggest cardiovascular response, make sure you're moving quickly while maintaining good form, and if you can, add a hop as you move from one side to the other. Plyometric exercises like this one elicit a quick and significant increase in cardiac response. Stand tall, your feet hip-distance apart, your knees slightly bent, your core engaged. Take a step to the right with your right leg, planting your foot on the ground as you sweep your left foot behind your right and reach down and across your body with your left hand, reaching it toward your right foot. Make sure you keep your torso straight, pressing your hips back as you lean. Immediately take a step or hop to the left with your left foot, this time sweeping your right foot behind your left as you reach toward your left foot with your right hand. Continue for 20 to 30 seconds as fast as you can before enjoying a 30- to 60-second rest. The beauty of these four cardiovascular exercises is you can actually combine them into a tough and effective workout by using them in a Tabata. A Tabata consists of eight rounds of 20 seconds' worth of work, followed by 10 seconds of rest. In this case, you can head to the gym or a nearby park, set a timer, and start your sequence. Simply run as fast as you can for 20 seconds, then rest for 10. The next interval, do 20 seconds of burpees, then 20 seconds of jumping jacks, 20 seconds of skaters, and so on. To complete the Tabata you'll perform each exercise twice. After performing one full Tabata, rest two to four minutes, then repeat the series three more times. Laura Williams is an exercise physiologist and fitness writer whose masochistic side can’t get enough of burpees and Tabatas. Connect on Twitter @girlsgonesporty.